Okay, might take a while to save up for one of these, but would sure as hell make the commute more interesting! Now, where do you buy AvGas in Central London? Of course, I want to be doing 150mph, at 15k ft altitude on my tip toes! 15,000 foot?! That’s on the limit of where you can still breath. I think they’re more likely to be used around one or two thousand feet? Still a big way to fall and not the place to be in that vehicle. Does anyone actually.velieve this will ever become reality? At least in our lifetimes? Of course it looks cool but is it feasible? Jetpack Aviation has announced that it is accepting pre-orders on the Speeder. 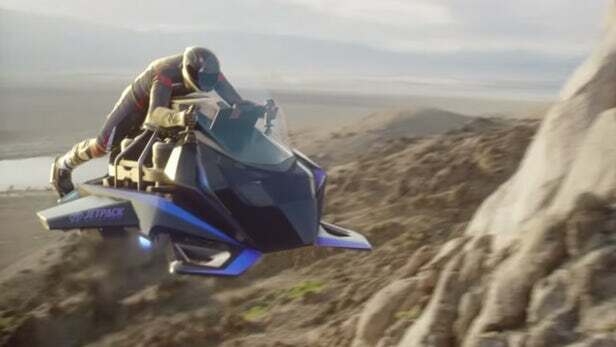 The Speeder is a self-stabilizing, jet turbine-powered flying motorcycle that can travel at a speed of 150 mph, offers a 20-minute endurance and can manage 15,000 ft altitudes. Does anyone actually.velieve this will ever become reality? At least in our lifetimes? Totally possible. At least technically, but whether or not it would go the distance and survive a startup, get certification and accommodating legislation to fly … probably not, but the military don’t need to pass those gates for it to be a useful tool for them. Though the endurance isn’t very impressive, so maybe not for them either. If they could get it to last for an hour or two that might be a bit more useful. What’s more likely to succeed is a ducted-fan electric version. Especially when we get the energy density up and perfect small-motor fans. What they mean is it can go up to 15000 feet before the air gets too thin for the turbines to keep it aloft. It wouldn’t get up that high and back down again within 20 minutes anyway. You can get avgas from North Weald, London City, Elstree or Stapleford. If I had enough money to spend £300k on a folly I’d have no hesitation in buying one. I’d have no practical use for it. but how can it be classed as a Motorcycle ? by definition it should have wheels . So I can fly on my motorcycle licence? That depends on the quality of narcotics ingested beforehand.